PHILADELPHIA -- When the Philadelphia 76ers went all-in on this season not once, but twice -- first by trading for Jimmy Butler, then for Tobias Harris -- it was because they saw a window to compete for a championship right now. It was a decision fraught with risk. Philadelphia gave up a lot to trade for both players. And with both of them headed for unrestricted free agency this summer, those deals could wind up being a pair of extremely expensive seasonal rentals. Then there's the fact that it's hard to work in one star-level player in the middle of an NBA season -- let alone two of them. Still, the Sixers have always argued it was worth the risk. Why? Because in the NBA, talent generally wins out. And after making those moves, Philadelphia could credibly argue that it can roll out a five-man lineup of Ben Simmons, JJ Redick, Butler, Harris and Joel Embiid that is as good as any quintet in the NBA today. On Wednesday night, they combined for 110 points in Philadelphia's 118-115 victory over the Boston Celtics, showing just how good they can be. "We got some true talent in the starting lineup," Butler said. "I think, when you look down the line, we have a group of guys that can do something special if we're out there on the same page, we're all playing hard and we're all competing." Wednesday marked the eighth time since acquiring Harris that the Sixers had all five of their starters available to play together. In those games, Philadelphia is now 7-1 -- with its lone loss coming before the All-Star break to the same Celtics team it beat Wednesday night. Across 135 minutes, Philadelphia has outscored its opponents with its starters on the court by 63 points. On a per-possession basis, they are outscoring opponents by almost 19 points per 100 possessions. "We're starting to play better, especially with this new group," Embiid said. "We still got a long way to go, but I'm excited." There was plenty for Philadelphia to be excited about from this game. The Sixers finally exorcised their demons against the Celtics, to whom they already had lost three times this season -- and had lost 10 of their past 12 games against, dating back to last season. 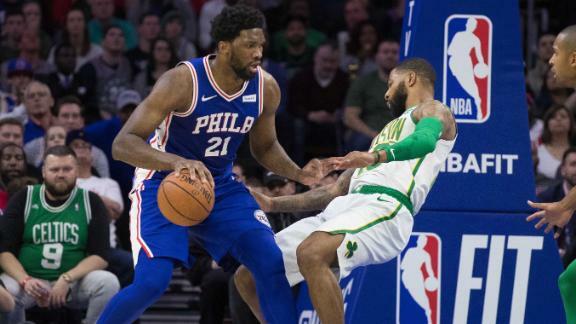 Sixers coach Brett Brown had said after Boston beat Philadelphia for a third straight time last month that he wasn't worried about the psyche of his team being impacted by previous losses to the Celtics. But he admitted before Wednesday's game that a win would be "important." Afterward, he pointed to the new group the Sixers have as proof that, despite the prior losing, things should be looked at differently now. "What [people] should say, if we're all sort of fair and reasonable, is that we have a new team," Brown said. "Maybe the times have changed. "Although that number isn't large, eight games together as the starting five, the excitement of what we can grow to and as I keep saying, jumping to this playoffs and take off is what my job is. I think the spirit of the group, I thought the tenacity of that team, where they didn't waiver in belief, was as much of an important factor to me as it is when I look down and say, 'Oh, by the way, we won.'" How they won might have been even more important than simply beating the Celtics. 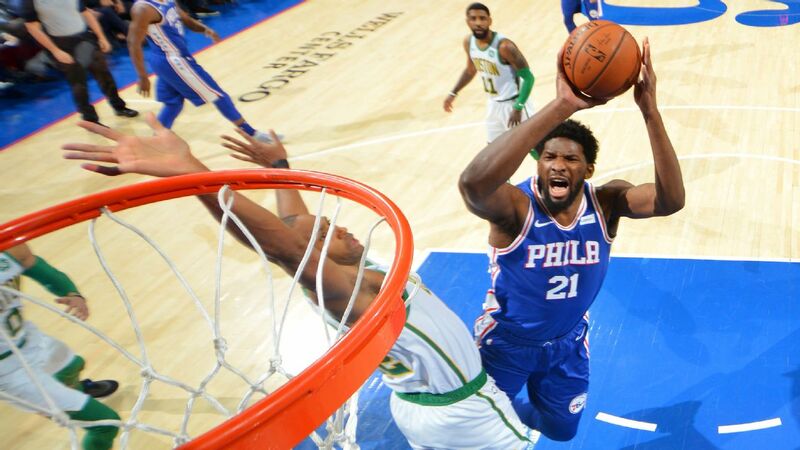 Embiid, who has struggled against Boston and Al Horford over the past two seasons, finished with 37 points and 22 rebounds. He was 20-of-21 from the foul line, getting there more often than Boston (16) did as a team. 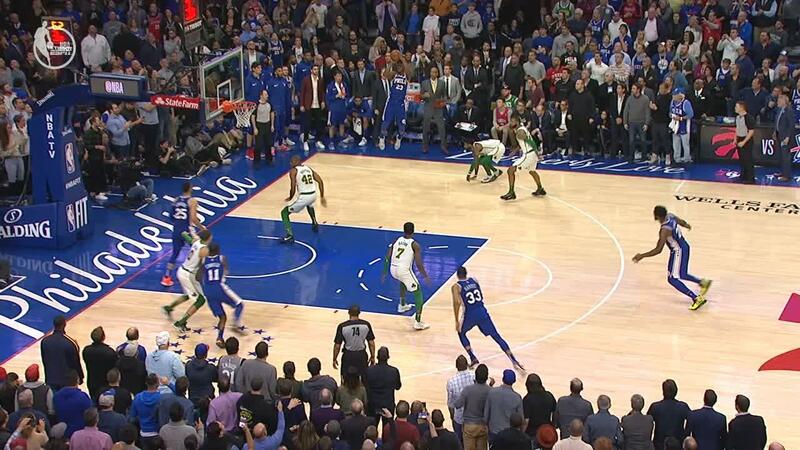 After being attacked in the pick-and-roll all night by Boston, Embiid made the defensive play of the game when he swatted away an Irving attempted layup in the final minute. "First of all, I'm glad we got the win," Embiid told ESPN in an on-court interview afterward. "Second of all, this is why I'm the best defensive player in the league. And third of all, I've been hearing that these guys can guard me better than anybody else, so I just had to come out and show I'm the most unstoppable player in the league." Butler, who has begun to assume the role of closer that he was supposed to inherit upon arriving in Philadelphia, scored 15 fourth-quarter points. It is the nature of these Sixers that Butler, an All-Star player, can go unnoticed for large stretches of a game such as this -- only to rise up and nail a trio of 3-pointers in the fourth quarter, followed by an 18-foot jumper on the baseline to put Philadelphia up five and seal the win. "They put the ball in my hands in the fourth and tell me to make plays and make shots," Butler said. "I think, as of late, I've been doing a good job of that. But that could be anybody, to tell you the truth. As many weapons as we have on this team, anybody can get the hot hand. Anybody can put the ball in the basket. The last few nights, it's been me." That Philadelphia was able to generate 110 points from that starting group was impressive enough. Add in the fact that the starters combined to shoot just 31-of-78 (39.7 percent) from the floor and 10-of-28 (35.7 percent) from 3-point range and it was further proof of just how explosive these new-look Sixers can be when they get rolling. "I still think we're trying to figure things out a little bit, and I think we all sort of have to learn, I think, just the flow of the game at times is a little different than some of us have [been used to]," said Redick, who had 17 points but went just 4-of-14 from the floor. "Some of us, we can go five, six possessions without really touching the ball. But, yet, you look up and you're like, 'Oh, we have  points at halftime.' So, those are the things we've just got to keep sort of learning about playing together. Because I think the talent is there, and there's a real chance for cohesiveness, because I do think our skill sets complement each other." Still, for all of the positive vibes Wednesday night's victory created here, there are just as many signs for caution. Boston lost Aron Baynes to a Grade 2 left ankle sprain, an injury Brad Stevens said will keep Baynes out into the playoffs, and Marcus Smart, who was ejected for a foolish shove into Embiid's back that resulted in a flagrant foul 2. And for all the praise directed at the Phantastic 5, Philadelphia's bench was dreadful. The combination of Mike Scott, T.J. McConnell, Boban Marjanovic and James Ennis III scored eight points on 3-for-16 shooting, and all of them finished with negative plus/minus figures. That, though, was always part of the calculus when the Sixers made the moves that they did. Yes, Philadelphia is top-heavy. But in the NBA, given the choice between a well-rounded team or a top-heavy one, the latter gives teams a higher ceiling -- especially come playoff time, when starters play more minutes. The Sixers made that bet when they swung for the fences twice -- first for Butler, then for Harris. On Wednesday night, they showed the basketball world what it looks like when they connect. 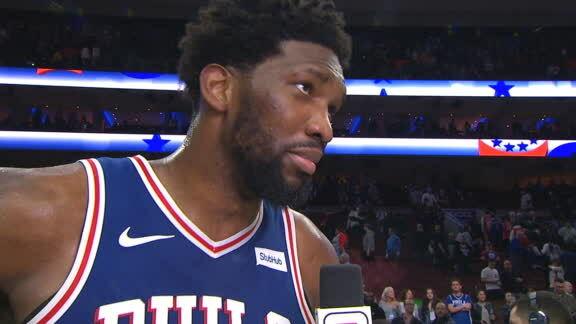 Joel Embiid tells Cassidy Hubbarth that his performance vs. the Celtics proves he is the best defensive player in the league and the most unstoppable.